The following is the first of three guest posts by Annette Stevens. Hello Elizabeth, thank you for agreeing to this interview. At what age did your 'Kinship' with Sylvia Plath begin? I was fourteen. One day a girl who sat behind me in geometry was reading Sylvia Plath's Collected Poems before class started. I was struck by the way the book looked—it was the 1981 edition with that interesting brush-stroke font. And the name "Sylvia Plath" sort of bewitched me—I loved the way the letters looked together. Later that year a friend leant me her copy of The Bell Jar—the version with the very gothic cover—the velvet gloved hand holding an upside down rose. I'd never seen words used in such a vivid, visceral way. It was like reading in Technicolor. Out of all her poetry, do you have a favourite poem? "Fever 103". The "weak hothouse baby" the hot metal beads flying out—it's a poem you can feel on your skin. In five words, what is The Bell Jar to you? How did you come to the idea to write a book about Sylvia Plath? My Sylvia Plath—the one you'll find in the Unabridged Journals—is full of bright red energy and joy takes a real sensual delight in life. You can see that in the poems too. I was sick of seeing her flattened out into the grey image of a depressed woman. Yes, she experienced spells of depression—but those spells made up such a small fraction of her life. 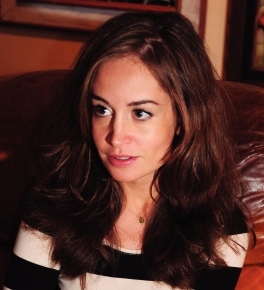 People feel some sick compulsion to reduce women to their worst moments. Hemingway suffered from depression and committed suicide. But in our mind's eye he's banging on a typewriter in Paris or buying shots for an entire fishing village in Cuba. We remember him not just for his talent, but for his zest for life. We should do the same for Sylvia Plath. 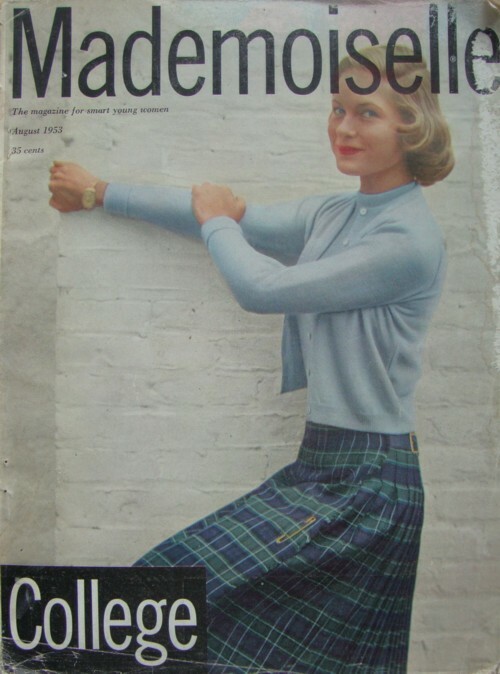 Why did you focus specifically on Plath's time at Mademoiselle Magazine? Those four weeks were so dramatic, dazzling, and densely packed. It always surprised me that other biographers seemed to kind of gloss over them. Sylvia loved fashion, she loved New York. 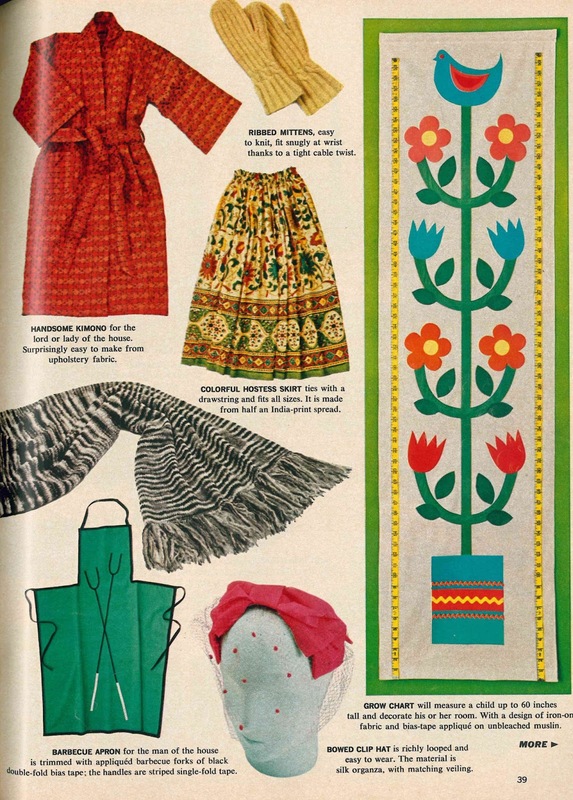 And I've always love mid-century fashion and material culture, so it was fun to immerse myself in that. 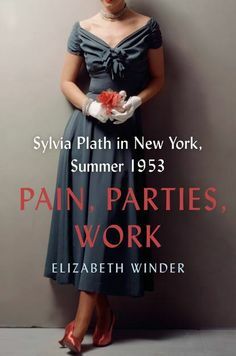 In writing Pain, Parties, Work, you interviewed guest editors who had an editorship at the same time as Plath. How did you go about doing so? That was the best part of the process—I was so lucky. The Guest Editors I reached out to were so generous and witty. I loved hearing all their stories—gossip in the hallways, scenes in the elevator, borrowed clothes and very, very late nights! Whilst writing the book, did you compile any research? Yes—I went through the Plath archives of the Lily Library. I practically buried myself fin research but it was all such great stuff—shopping lists, clothing budgets, diaries from junior high and stacks and stacks of letters from her numerous boyfriends. How long did Pain, Parties, Work, take to write? Maybe about a year and a half. It was total immersion. Would you ever consider writing a follow-up to Pain, Parties, Work? That's interesting—I hadn't thought of that! Actually, in a subtle sort of way I think the book I'm writing now is a follow up, even though it isn't about Sylvia Plath. Overall, do you think that Plath was a victim of her time-"being an ambitious girl" in 1950's America? Absolutely. We don't give the women of Plath's generation enough credit. Girls like Sylvia—and all the Guest Editors—were under tremendous pressure. "Get into the best school, keep your scholarship, win prizes and make sure you're invited to the Yale Spring Dance…" But women are always bombarded with mixed messages. That's why Sylvia's struggles are just as relevant today. Previously, have you worked in the publishing industry? Oh, not at all. It was completely new to me. Yes—I think I was about five when I realized that and I haven't wavered since. Words and images! Reading Anna Karenina for the 20th time, Anne Carson's amazing poetry, the scent of the shampoo I used when I was twelve, the name of a nail polish shade in the Ulta catalog, a 17th century French cookbook. Anything and everything. Are there any more Sylvia Plath-inspired projects in the works? Not at the moment, but I wouldn't rule it out. For anyone wishing to follow in your footsteps, do you have any tips? Read! Seek out the writers that resonate with you, and then seek out more. Read and re-read and re-read again and copy the sentences and phrases you like best in notebooks. Study the syntax your favourite writers use, the way they stick words together. Pay attention to what you like and why you like it. What is your favourite black and white film, prior to the 1960's? Great question! The Rules of the Game by Jean Renoir (1939.) There's a hunting party in this French chateau, lots of banter and flirtation and sly looks. At night everyone is darting in and out of their rooms, running around in these silky ruffled robes, sneaking around with their lovers. There's an adorable pouty little French maid named Lisette who will make you want to wear white and black for the rest of your life. There's a count dressed up as a teddy bear, tons of drinking, lots of slinking around in wine cellars and china closets to kiss someone or make a crazed love confession. There's a real darkness there—sad marriages, broken hearts, death—but at the same time there's this dizzy pajama party vibe that always makes me smile. By mid-October 1961, Sylvia Plath was already thinking about Christmas as she and Ted Hughes were hard at work making Court Green in North Tawton not just their own, but also livable. She mentioned in letter dated 13 October that year of her desire to make her daughter Frieda Hughes a doll's wood cradle. Christmas likely sprung into her mind as she had recently received a from her mother mentioning that she would be sending her granddaughter a doll for Christmas. The subject of the cradle was mentioned in general in subsequent letters to Aurelia and Warren Plath on 18 December 1961 and to her Aunt Dorothy Benotti on 31 January 1962. In "These Ghostly Archives 4: Looking for New England", Plath scholar Gail Crowther discusses this very doll's cradle (see pages 44-47; an image of the cradle appears on page 45). Working with the documents Plath and Hughes created is one thing: particularly those which bear evidence of both the poets such as poetry or fiction manuscripts or their address book. But this cradle is also something to which both Plath and Hughes contributed. Hughes made the cradle and Plath enameled and painted it. In Birthday Letters, Hughes called these items a "Totem", writing: "You painted little hearts on everything . . . Sometimes, off to the side, an eight-year-old's bluebird . . And on the cradle I made for a doll you painted,/Hearts" (163). As Gail stated in our paper, "Such items, we feel, belong in an archive because they are able to bring Plath alive in a unique, multi-dimensional manner. In many ways they do not feel 'of the past,' but rather very much of the present" (46-47). In a second installment to a letter Plath wrote on 29 December 1961, she discusses a little more about the cradle, and from where the design and inspiration came. The part where Plath writes about the cradle was was edited out of Letters Home and so therefore cannot be quoted. But, the original letter is held by the Lilly Library for anyone who visits to read. In this 29 December 1961 letter, Plath mentions that Marion Freeman sent her some copies of Woman's Day magazine which left her with a nostalgia for American-market women's magazines. Marion Freeman, sometimes called "Aunt Marion", was the mother of David and Ruth Freeman. Ruth, fondly called Ruthie in Plath's letters and diaries, was Plath's best childhood friend from Winthrop. In one of those issues of Woman's Day, Plath found the ideal design and pattern for a cradle made of wood. 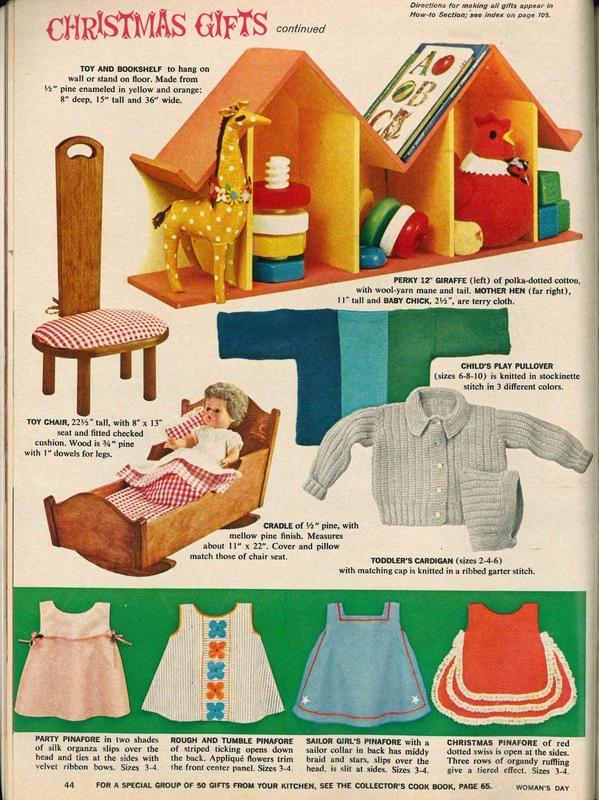 In a letter to Marion Freeman dated 31 January 1962, Plath thanks her for the Woman's Day magazines and mentions how a design in one of the issues was just right for a doll's cradle they made for Frieda for Christmas. She mentioned too that that she got inspiration for the imagery she painted on the cradle -- hearts and flowers (and birds) -- from the quilting section. This got me thinking: which issue of Woman's Day was it? 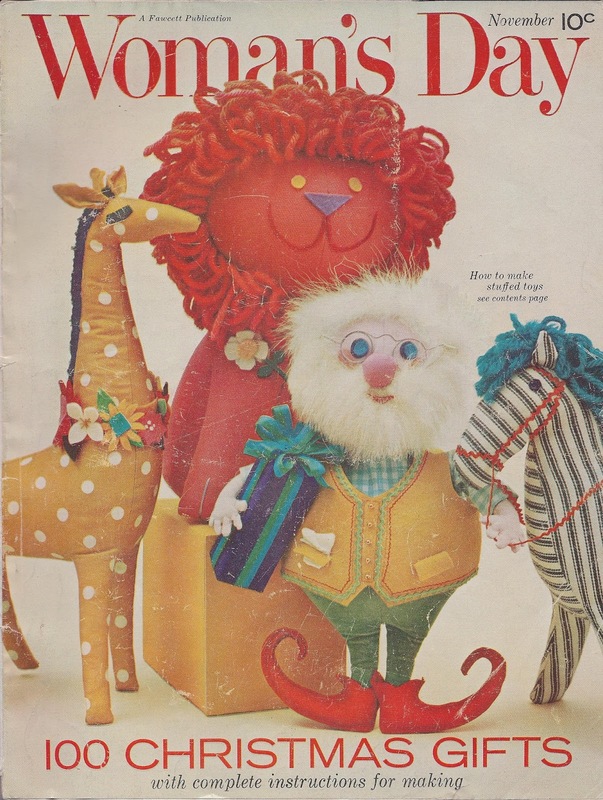 I found via a search on eBay that the November 1961 issue had a big Christmas section in it, and so started there. 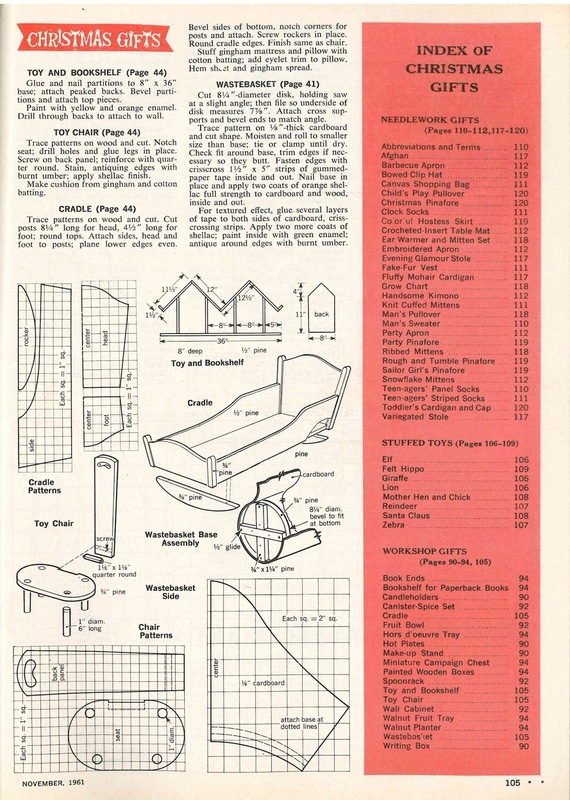 By chance (or luck), I had to look no further as the seller of the item confirmed to me that the November 1961 issue had the instructions for building a cradle. The quilting section Plath referred to was on page 39; a photograph of a cradle on page 44; and the instructions on cutting the wood and assembly on page 105. As you will see in the images below, Plath made her own of the flowers and used the colors and general shapes to inspire the hearts, sun, and decorative flourishes, but the bluebird is just about spot-on. Plath also painted hearts and flowers on a chair, a wastebasket, and table. These four household items are held by Smith College; and a color image of them was recently reproduced in Elizabeth Sigmund and Gail Crowther's Sylvia Plath in Devon: A Year's Turning (2014). Seeing the cradle in the Mortimer Rare Book Room at Smith College and holding it is truly a wonderful experience. For me it ranks up there with seeing a poetry manuscript, her journals, a typescript of The Bell Jar: really anything Plath created. "Realia", can be classified perhaps as a more fetishistic object than a manuscript would be: certainly this kind of thing falls out of the traditional purview of academics. But it is an important product and relic regardless. It is something, like a sketch or drawing Plath made, to which she temporarily devoted all of her mind, creativity, and energy towards completing. Plath said as much in a letter to her husband Ted Hughes on 7 October 1956. On drawing teapots, shoes and chestnuts, she said, "it gives me such a sense of peace to draw; more than prayer, walks, anything. I can close myself completely in the line, lose myself in it" (Sylvia Plath: Drawings, 3). And seeing the original issue of Woman's Day that gave Plath her idea's is also fascinating. It felt surprisingly unreal, if you catch my meaning. And stepping back like that into November 1961 was quite interesting for the advertisements and articles. Those are long gone days. You can see how Plath took something she studied and transformed it into a veritable timeless work of art: much the same way you can find nuggets real people and experiences metamorphosed in her poetry and prose. All links accessed 6 March 2015. Emory University recently put a finding aid online for the Sylvia Plath collection, 1952-1989. A small collection, but one certainly with significant materials for the Plath scholar. The material in folder 1, Compass is the the magazine of Southern Massachusetts University (now University of Massachusetts, Dartmouth), and features an article by Maeve Hickock titled "Aurelia Plath and Richard Larschan". The article is about the video production of the Plath program in the Voices and Visions series from 1986. A second article, "A Case of Mistaken Identity" by Charles White, is on the then recent Jane Anderson lawsuit against Ted Hughes and the makers of the 1979 film version of The Bell Jar. The materials in folders 2 through 5 are original periodicals featuring Plath's work ("The Times are Tidy" in Mademoiselle, January 1959; seven poems ("Two Campers in Cloud Country", "The Elm Speaks" ["Elm"], "Mystic", "Amnesiac", "Mirror", "Among the Narcissi", and "The Moon and the Yew Tree" -- essentially everything the magazine had purchased from Plath since 1960 yet to be printed) in The New Yorker, 3 August 1963; "Sunday at the Mintons'" from Smith Review, Fall 1952; and "Mad Girl's Love Song", "To Eva Descending the Stair"; and "Doomsday" from Smith Review, Spring 1953. Each of these contains annotations in Aurelia Plath's hand. Particularly moving is Aurelia Plath's commenting that she relates to every word in stanza 10 from "Elm": "I am inhabited by a cry. / Nightly it flaps out, / Looking, with its hooks, for something to love." The Trevor Thomas materials in Folder 6 include a copy of Thomas' limited edition memoir Sylvia Plath: Last Encounters; a letter from Thomas to Larschan dated 30 November 1989; and a photocopy of a newspaper clipping "Poet Laureate Serves Writ on Professor" from Bedfordshire on Sunday 21 January 1990, page 9. The letter concerns Aurelia Plath, Anne Stevenson & Bitter Fame; Clarissa Roche; mentions Elizabeth Sigmund; and the lawsuit against Thomas by Ted Hughes. Thanks to Amanda Golden for alerting us to the availability of the small collection. All links accessed 23 & 27 January 2015. Post modified 3 May 2015. The following is a transcription of the public statement offered by Peter K. Steinberg of the Sylvia Plath Info Blog, which aired on Seattle's WC8H10N4O2 (the Starbucks Network) this morning at 4:01 A.M. local time. For the last eight years, Sylvia Plath Info Blog has been providing posts on Sylvia Plath covering a range of topics including archival materials, to newsworthy events, books and book reviews, and quasi-live blogging from conferences. Unfortunately, much the content and information presented has been done so under the influence of performance enhancing drugs. Admitting this at this point in time (I was going to hand write it in the attempt to have it come off as more sincere) is a big step for me in conquering the problem. Continually I had intended to try to break free of the grip these drugs have had on me. But to no avail. I want to apologize deeply and sincerely if I have let any of you down as a result of this admission. Kindness--in the form of comments, followers, and emails--served only to egg me on in a way I am sure none of the blog's readers intended. But naturally, defensiveness and over-sensitivity has led me to privately blame each of you in the attempt to not accept accountability for my actions. Youth was passing me by, and I felt desperate to keep up both with the more seasoned and recognized Sylvia Plath scholars, as well as trying not to lag too behind the newer, smarter, and more talented ones. Only one option seemed right: the cheating option. Under no circumstances did I ever think I would be caught, but caught I was. Which has led to this statement. Recent history of politicians and professional athletes also being caught doing various nefarious deeds has led me to believe that a full acceptance of responsibility --no matter how disingenuous-- followed by a period of laying low, will provide the opportunity for the masses of us with short-term memory issues (developed from being over-stimulated on media in all its various formats and functions) will allow me to make a full and triumphant comeback. Just about twenty-four hours from now, I will be entering a program to ween myself off of these drugs in an attempt to get my life back. It is a very rigorous program and will test my strength and will. Unless this turns out to be a failed recovery, I hope to return to blogging on Sylvia Plath -- and doing so cleanly -- by the end of the month or maybe sometime in May. I hope you understand and forgive any silence from this blog in the meantime. It is imperative that I go through with this. Let it not go unsaid that I feel as though I have let you all down. Which is weird considering, obviously, you are all in some ways responsible... I will do everything in my power to crush this demon. To rise from the ashes like "Lady Lazarus" herself. I make a promise to you to that should I succeed in shocking my system clean and clear of this performance enhancing drug, I will return better, bigger, and stronger. More terrible than ever I was. More ferocious a Plath scholar than can be fathomed, with a heart dedicated to being a clean scholar. Only time will tell, I suppose, if I can defeat this. My only hope is that you, dear readers, can give me a second chance. Thank you for reading and for being so understanding.